Click to buy Ocean’s Edge! 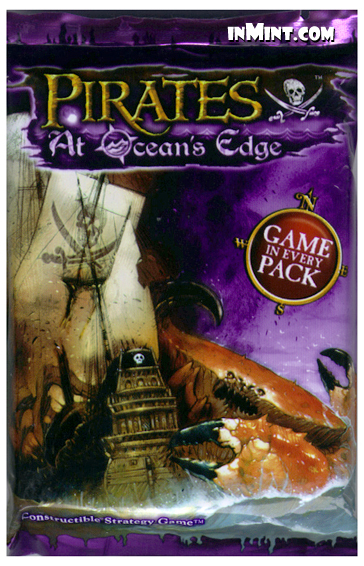 Pirates At Ocean’s Edge (OE, 2007) was a large set that got produced in huge quantities, featuring a ton of different ship types as well as new types of sea monsters. Due to the massive production, it’s both the cheapest set and the easiest to find. It features the “Big 6” factions together again, marking the end of minor factions being introduced in their own sets. OE is a great set for beginners due to the variety, quantity, and price. Highly recommended if you’re on a budget and just getting into the game, though it can get boring once you’ve used the stuff from the set a lot. It’s also not balanced at all, as some game pieces are terrible and some are among the best in the game. You can find all of the game pieces in the Master Spreadsheet, and I’ve ranked the Top 10 here. – Art: 1/5. The ugliest ships are from this set. Overall the artwork is quite boring (Le Musarde lol – even the French got it), with a couple standouts (Zeus). Some of the ships are absolutely garish, and not in a good way (Salte el Tiburon). – Set Quality: 3/5. A lot of mediocre and extremely boring ships. 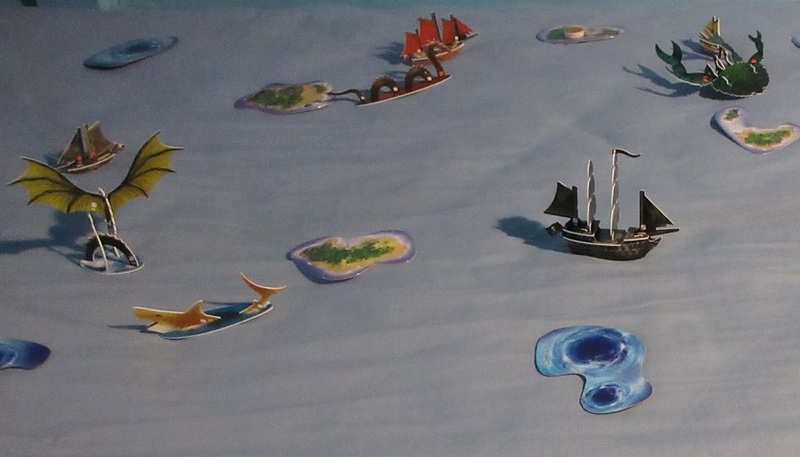 However, I didn’t give a 2 because there are some absolutely amazing finds here – the brief return of 6 masted junks, a few cool SE’s, two All-Powerful crew, surprisingly playable sea creatures, and some good 5 masters (except for the “new” Acorazado). In addition, the sheer quantity, especially when including the SE’s and LE’s, gives a ton of options for playing, which is great. – New Content: 3/5. Titans are the best sea creatures by far, and can be rather good. Sea dragons aren’t so hot, but they’re also few in number. The sharks are absolute trash, so thank Wizkids for not releasing any more in later sets (or condemn them for even releasing them in the first place!). Catamarans have always seemed overrated to me, and their disproportionate size looks silly. Windcatchers have always seemed like a glorified 3 masted schooner, but the ones that came out are certainly interesting to play. I happen to love whirlpools, despite them not being realistic at all. Obviously a ton of new stuff – once again the sheer quantity helps the score because it gives options and pleases most people to some degree even if you only like one or two of the new things. – Collectability/Misc: 5/5. I rate the collectibility as a 3/3 easily, and though I would normally put the miscellaneous score as 1/2, the collectibility is so high that I’m giving the overall category 5/5 (collectibility breaks the scale heh). The biggest set ever, extremely cheap packs (great for new players), very easy to get most of the main set. SE tins rereleased some older ships, while they and the SE’s weren’t terribly difficult to find. Throw in megapacks, the legendary Zeus, and a tough LE set to collect, and you have a crazy collector’s dream while still being the most accessible set to new players due to how common it is and the low price. = Overall: 12/20. A set famous for being very diverse, common, and cheap. The prevalence of OE makes it very easy to get sick of; I have once again tired of it after a short renaissance around 2017. Use eBay to sail towards Ocean’s Edge! I’m just recently revisiting this game after having touched it slightly while I was a child, with the original spanish main set. I’m collecting a few sets now to get back into it and get my younger siblings into it. One of the biggest things I’m looking for, though, is getting my hands on a Zeus. I’ve been looking for weeks, but can’t seem to find anywhere that still sells them. Do you know if she actually comes in the ocean’s edge packs, or is there a better way to try?